This weekend saw the first 80-degree of 2013, which means our oh-so-brief spring is making its appearance, coinciding with the also brief appearance of St. Joseph’s Altars. Sicilians (and more than a few non-Italians) throughout the region have been cooking, baking, and decorating for weeks, culminating in tomorrow’s March 19th celebration of St. Joseph’s Day. 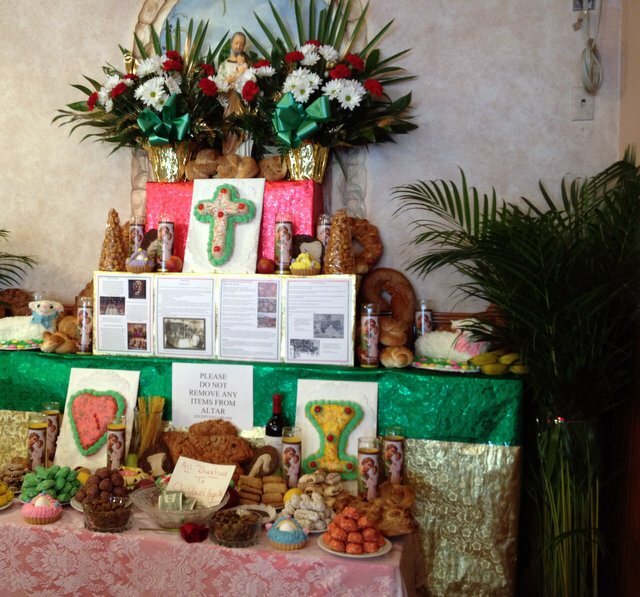 Pictured is the 2013 altar at Angelo Brocato’s ice cream & sweet shop, where an array of traditional cookies, breads, flowers, and fruit fill the display, along with the obligatory bowl of “lucky” fava beans. Why fava beans? Those favas are key to the origin of the St. Joseph tradition. During a medieval famine, starving Sicilian peasants prayed to him for intercession, as crops were failing—but their prayers were answered and the fava bean plants survived and thrived. So the peasants ate the beans (previously used only as cattle feed), surviving to venerate St. Joseph each year on March 19th for more than 500 years. The altar displays are deeply symbolic arrangements: typically consisting of three tiers (for the Holy Trinity), filled with breads and pastries (often filled with figs or flavored with fennel or anise) in the shape of religious objects (monstrances, crosses, lambs, chalices, doves, and so on), and bedecked in colors and objects associated with St. Josephs (breadcrumb “sawdust”, hammers & nails, lilies, staffs, sandals). Foods on the altar are meatless, as St. Joseph’s Day falls during Lent. Father Mike’s website offers a detailed look at altar symbolism and the traditions of making and then “breaking” an altar, including the Tupa Tupa ceremony. Today, the altar tradition is a regional one, thriving in pockets of the U.S. where Sicilian immigrants settled, though the altar-makers aren’t necessarily of Italian descent themselves. Often, the devotional act of altar creation is undertaken in thanksgiving for prayers answered: a family might create an altar when a cousin returns home from military service, or when an elder recovers from a major illness. Click here to see WWL-TV’s list of St. Joseph’s Altars around the area, including some traditional home-based altars open to the public. Tomorrow, the altars will be open to the public, and many will serve a meal to all visitors. It is traditional to make a financial contribution when visiting an altar, and all visitors typically receive a small bag containing a prayer card, fava bean, small bag of cookies, or religious medal. Just returned from St. Joseph parish in Galliano, LA. Had a wonderful late lunch of shrimp spaghetti, a boiled egg, and religious-themed sheet cake all prepared by some wonderful authentic Cajun cooks who may or may not lay claim to any Italian blood whatsoever! The goodie(sp?) bags with their lucky beans, blessed bread crumbs, blessed salt, and assorted cookies were also great. I’m always confused by the blessed salt–are you supposed to use it or what? I know that the blessed bread is traditionally put into the freezer to be broken up and tossed into the wind, thus abating a potential storm. Not so sure about the salt…. Really enjoying your site. You’re Bisque recipe is the same as Mom’s. She always stuffed the heads, it was a standing joke about how you use you thumb nail in the crawfish head when boiled to get at the fat, then you use your thumb nail again to get the stuffing out the stuffed head (because the carpace closes in around the stuffing when cooked). I am guessing you’ll understand.